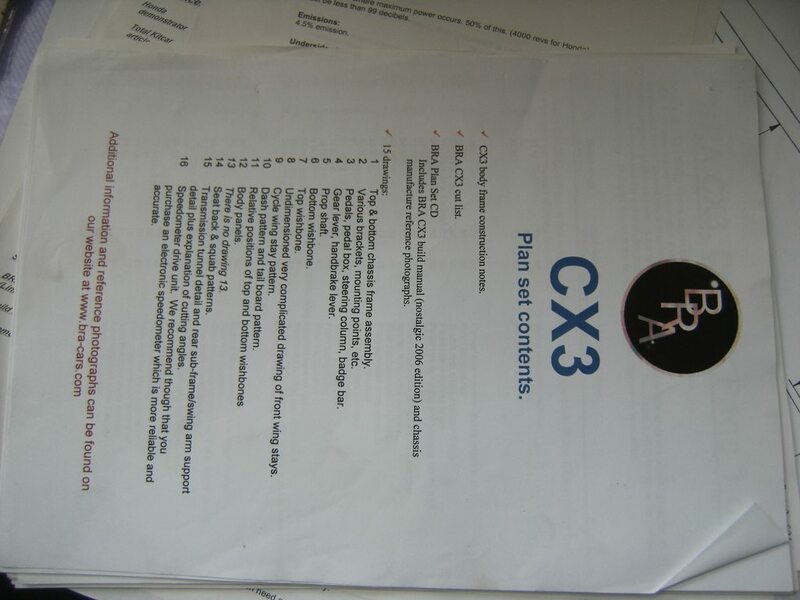 anybody has a set of plans of BRA CX3 plans to sell? is pretting long i'm searching it, but so far.. no luck. i tried to contact them but.. seems nobody at the other side. I have a set of plans, build manual and CD for the CV3. The CX3 is Honda CX500 powered and the CV3 is 2CV powered. The basic chassis should be the same as one is just a modification of the other. biggest difference is in suspensions. cv3 reuse 2cv arms instead of fabricated (i guess) arms. @mrred9, i took a look at the link, shopping is disabled. Hi Micky1mo,is this still available for offers ? Send him a PM. They were a week or two ago. I just did, crossing m'y fingers ! Unit 3B, Darby Close, Swindon, SN2 2PN. I'm still here alive and kicking. Please note- -the plans I have are for the CV3 (Citroen 2CV based three wheeler) and NOT the CX3 (Honda CX500 based three wheeler). Yes I still have them (hiding some where) and yes I will sell the for the right price. The package weighs just over 1kg so postage will not cheap. I'll start looking for the package in the morning. That is great that it is for a CX3. Now the important question.... How much would you ask for the whole set ? Sell it as a bundle, the best chance for it to get on the road in finished form. I have the BRA original drawings! I only just found this forum. Interesting. As the person who drew all the plans, and one of the directors, I have all the original plans in my loft although from memory, I don’t actually have any sets already printed. All times are GMT +0. The time now is 07:04.